Every rider who has more than a handful of miles on their bike knows all too well the unique sting that comes from long days in the manufacturer’s saddle. It’s such a common refrain amongst motorcyclists, that it’s almost become a trope - Stock seats are just plain uncomfortable. For some, the solution is a halfhearted attempt to increase usability with a gel pad, lambskin or awkwardly placed set of “taxi driver” beads. For others, it’s shelling out big dollars for a hand crafted, one-off seat, molded and customized to the rider’s specific shape. Above: The BMW F650/F800 seat from Seat Concepts runs about 1/2 the price of the least expensive custom seat job available locally. But for those looking for another way, one that offers a higher performing seat at a faction of the cost compared to a full custom job, they just might look to Seat Concepts. Founded by friends and business partners Langdon Smith and Robert Lightfeldt, Seat Concepts began as a side project when the pair noticed a prominent gap in the market for affordable, motorcycle seat replacements. Drawing on their personal riding experience and Smith’s experimentation modifying seats for the vintage bikes that he raced, the two started to churn out prototypes, quickly drawing interest among fellow riders. When Lightfeldt built a seat for a friend in exchange for a shout out on a popular web forum, riders from around the country took notice. And just like that - Seat Concepts was officially born. Fast forward to today, approaching their tenth year in business and the once two-man business has grown into a veritable aftermarket powerhouse. Which is why, in addition to offerings for 19 manufacturers, across all genres of motorcycles including dual sport, dirt, touring and standard, Seat Concepts has a wide range of style-specific models that are geared toward a rider’s performance goals – from dirt, racing, to comfort. And though many customers initially think that they are looking for simply a softer seat, Lightfeldt cautions that an increase in padding won’t necessarily fix inherent shape or geometry problems. As an example, he offers that one very common situation on adventure bikes is that the stock seat is over-sloped at the gas tank. “If you try to scoot back to where the wider spot is,” the co-founders note, “there is a natural forward slope to it...so you never stay back, you always slide forward.” A seemingly small inconvenience, but one that Robert says can add up on a longer ride leading to premature fatigue and discomfort. So, while foam density can have a big impact (Seat Concepts makes their own foam in-house and are able to offer custom density foam that is catered to a rider’s preferences), Lightfeldt encourages prospective buyers to really consider their riding style and goals before purchasing an upgrade. Their wide range of “off the rack options” has certainly been well received by riders as in mid-2017, outgrowing their facility in Southern California, the company moved to Caldwell, Idaho, and is already set to again expand. “We just bought another building next door to ours,” Lightfeldt says proudly, adding that he has been very happy with the choice to move to the Pacific Northwest. “Every time I go back (to California), I’m always like, how long do I have to be here?” he says with a laugh. An active rider himself, Robert notes that the only downside to the company’s success is the lack of opportunity to actively explore the new state he calls home. Though, as of late, he has found some relief while testing the company's next product line, the XLs, designed for those riders looking to really put on the miles. Maintaining that direct connection to both the sport and the community is clearly something that is important to the company. Lightfeldt and the team can be seen at several events throughout the year and they always welcome inquiries on how to find the perfect seat. The company’s website and FAQ’s are a great place to start, says Robert, further inviting those interested in Seat Concepts to pick up the phone and give the company a call. 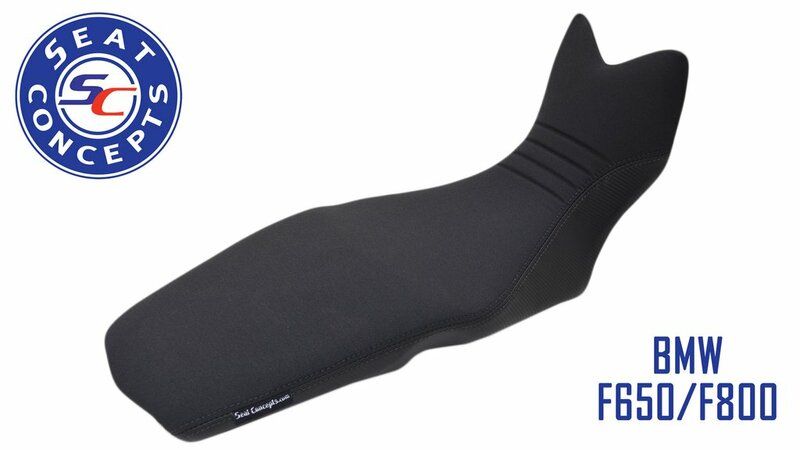 For many riders that’s more comfort, better performance and better days on the road. And for many riders that just might be a Seat Concept seat.